18.2 Intelligent Keys versus Surrogate Keys. 18.2.2.6 Standards Versus "Roll Your Own"
Do you need an introductory book on data and databases? If the book is by Joe Celko, the answer is yes. Data and Databases: Concepts in Practice is the first introduction to relational database technology written especially for practicing IT professionals. If you work mostly outside the database world, this book will ground you in the concepts and overall framework you must master if your data-intensive projects are to be successful. If you're already an experienced database programmer, administrator, analyst, or user, it will let you take a step back from your work and examine the founding principles on which you rely every day-helping you to work smarter, faster, and problem-free. 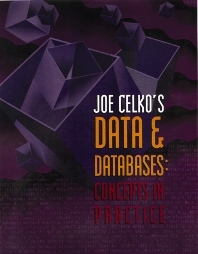 Whatever your field or level of expertise, Data and Databases offers you the depth and breadth of vision for which Celko is famous. No one knows the topic as well as he, and no one conveys this knowledge as clearly, as effectively-or as engagingly. Filled with absorbing war stories and no-holds-barred commentary, this is a book you'll pick up again and again, both for the information it holds and for the distinctive style that marks it as genuine Celko. Supports its extensive conceptual information with example code and other practical illustrations. Explains fundamental issues such as the nature of data and data modeling, and moves to more specific technical questions such as scales, measurements, and encoding. Offers fresh, engaging approaches to basic and not-so-basic issues of database programming, including data entities, relationships and values, data structures, set operations, numeric data, character string data, logical data and operations, and missing data among others. Covers the conceptual foundations of modern RDBMS technology, making it an ideal choice for students. Programmers and other developers working on database applications development.